What sort of screen do I need? There are two basic types of projection screens. Best possible option due to perfect lay-flat. Only suitable for a dedicated wall space. The premium choice for home theatre rooms. The only style of projection screen that is dead flat. For multipurpose rooms eg: meeting rooms, boardrooms, family rooms. Available in different styles. Motorised screens are flatter and last longer than manual screens, with tab-tensioned motorised being the flattest. What format should my screen be? Please note: Screen Technics can make almost any type of ratio screen you require. Measure from the middle of your chair, to the proposed screen position. Divide that distance by three, and that is the correct approximate height of the projection screen. The format you choose will not alter this result, as the human eye has a very wide peripheral vision (side to side). It's the top to bottom view that is the limiting factor to viewing comfort. The projector's power and throw distance. The bigger the screen the more powerful the projector needed. Now choose the nearest standard appropriate size or have Screen Technics custom build exactly to your requirements, at no extra cost. What is the 2 to 6 rule? The closest viewing position should be no more than two times the height of the screen, with the farthest viewing position being no less than six times the height. The closest viewer is 3m from the screen, and the furthest viewer is 8m. Determine the above details and the size needed will begin to come into focus. If in doubt please call our customer service department on (02) 4869 2100 with the relevant details, and we will assist you with your decision. Do I need extra leader - what is it? 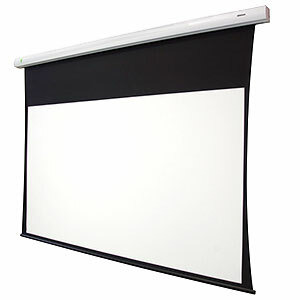 Leader or Top Black Border is the amount of masked (painted black) material that resides above the white picture area on most roll down projection screens. All quality projection screens in Video 4:3, HDVT 16:9, 16:10 and 2.35:1 format will have leader above the image area, as this lets you lower the image area down into the room to achieve a comfortable viewing position. Why would I need extra? Say you have a high ceiling and the standard leader length, which alters from product to product, still leaves the image area too high to be viewed with comfort, what do you do? - Order your screen with extra leader! The more leader you have the worse your Lay-Flat becomes on the screen, so seek advice as to what is acceptable before technical problems arise. It cannot be ordered after the fact - you need to consider it at the time of purchase. Because Screen Technics is a manufacturer - not an importer - we can accommodate these custom requirements. Available leader for each screen is noted on this website, if you have any questions about the amount of leader you can purchase for a particular screen please contact the sales office. What is gain and how much do I need? Everyone thinks that high gain makes your projection screen brighter - not true. What high gain does is redirect the light towards a narrower viewing area, thus increasing brightness for viewers sitting in that area, but decreasing it for viewers either side. Hey, that sounds great! Well, yes, it used to be great, when projectors were quite underpowered and produced 250 to 400 ANSI lumens of light (10 to 15 years ago), but now the norm, even for cheap end projectors, is 1200 plus ANSI lumens and the requirement for high gain (redirected light) has all but disappeared in favour of unity gain (rated as near 1.0 gain). Please note we are agents for Screen Innovations, who make purpose-built ambient light rejecting (ALR) screens. This may offer you a great solution in a highly lit environment. High gain screens always had a hotspot (bright circular centre) with fading brightness at the edges of the screen, which people used to tolerate to achieve overall brightness. But with new, powerful projectors, there is no need for brightness assistance, so why put up with hotspotting? Unity gain disperses the reflected light in multiple directions and this achieves evenness of brightness across the entire screen and has no artificial artifacts interfering with the projected image. Please note that high gain screens can still have some limited commercial applications. Seek advice. Why are fixed frame screens the best? The goal of all projection screens is to be as flat across the screen surface as possible, and no screen can beat a fixed frame screen in this regard, as they are tensioned 360 degrees around the framing system, creating a "drum" effect - perfection. Screen Technics' fixed frame system is called the CinemaSnap and is recognised as the best of its type in the industry, due to quality materials, ease of build and installation. Can I buy screens directly from Screen Technics? Screen Technics is a manufacturer and wholesale supplier of AV equipment and as such you need to purchase our products through a registered dealer. Please contact the sales office who will provide you with dealers in your area. Can I have a remote control for my screen? All Screen Technics products come complete with the ability to control via infrared remote control as well as low-voltage contact and 12V trigger. Some products can be controlled via IP. Micro-perforated screens - what are they? To experience true home cinema, you require a surround sound system with five speakers strategically placed around the room. One of those, the centre channel speaker (mainly for dialogue), ideally needs to be where the actors are speaking from - the screen. The solution is often to place the speaker below the screen, but you can place the speaker behind the screen by using a micro-perforated screen surface that gives you what's called acoustic transparency and lets the sound through largely unimpeded. This is standard practice in commercial cinemas, which use very small perforations or holes (invisible to the viewer) in the screen for sounds to pass though. This can provide a solution to hiding at least one of the speakers in your loungeroom while you enjoy the thrill of true surround sound. Screen Technics offers micro-perforated screen surfaces on their fixed frame CinemaSnap systems. How do I mount the screen in the ceiling? You can cut a hole in the ceiling and mount your screen in the dust, but if you want a professional finish then you have two great choices available from Screen Technics. Purpose built, in-ceiling unit that allows installation into the project at an earlier stage of construction. The projection screen can be clipped in at a latter stage when the dust has settled at the building site. It has all the internal bracketing and pre-wiring capacity required for a smooth project. The ultimate home theatre screen, this unit hides in the ceiling until you hit the down button.An automated trapdoor opens and the screen rolls down into view, ready for the movies - luxury! Please contact our sales department for advice on which unit would best suit your requirements. Lay-flat - what does it mean? The term lay-flat is a key screen industry term, that all quality manufacturers of projection screens are constantly thinking about! Headbox colours - can I have a custom colour? Screen Technics has its own in-house powder coating facility so you can choose from any of the terrific Dulux Powder Coat range of colours to suit your colour scheme at home. With over 100 colours, including a great range of contemporary metallic finishes, you will have no shortage of colour solutions at hand. This flexibility of colour choice enhances your movie-going experience by adding to your interior design options for building an integrated theme for your equipment and furnishings and stopping the AV gear visually dominating the room. Additional charges and lead times apply. Matrix White is a premium screen surface that comes as an option in our CinemaSnap fixed frame screen range. It is specifically designed to enhance the viewing characteristics and colour saturation levels of the projected image. Through improved resolution technology and using state of the art optical structures, this screen material removes hotspotting, is colour neutral and offers the sharpest resolution on the market. Matrix White will offer the viewer the best possible experience for home theatres. Can I use my screen in broad daylight? For the majority of projection screens, the entire theatre room should be as close to dark as possible, as ambient light will wash out the projected image to some extent, and the contrast (the difference between black and white) will diminish. Projection screens are not really an alternative to televisions. Rear projection screens: When the projector is behind the screen in its own dark room and you are sitting in a well-lit room on the other side from the screen. This works well and is popular in corporate environments, but it does require a fair amount of real estate behind the screen and for that reason is rarely used in home theatres. Screen Innovations’ (SI) Black Diamond®, the world’s first and only multidirectional ambient-light-rejecting (ALR) projection screen technology, has been a revolution. The material used in these screens enables a more accurate image representation than a matte white or grey screen in a high ambient light environment. Through this innovation and products including the Slate range, SI has developed technology that complements Screen Technics’ (ST) product portfolio. It’s for this reason ST is partnering SI to offer this innovation to the Australian market. Information on both screen types can be found in our products section on this website. The aim of any quality projection screen is to have perfect lay-flat, or lack of surface waves, to present the projected image as clearly as possible. But all motorised and manual roll down projection screens, by necessity, tightly wind their surface material around skinny tubes and thus create a problem for attaining good lay-flat qualities. The screen material rolls down with some waviness across the surface, this being an unavoidable feature of the roll down screen - well nearly unavoidable! Side tension screens use a curved radius cut down the edge of the screen and support that edge with an elasticised cord connected to the screen at regular intervals. This pulls the screen outwards from the centre, vastly improving the lay-flat properties of the projection screen. This can also assist in screens that require extra long top leaders, as this situation creates poor lay-flat also and the side tension system can really help this problem. Only available in motorised ElectriCinema models. Multi-formatting - sounds good, what is it? When selecting a screen one normally chooses a format shape, such as Video 4:3 or HDTV 16:9, and lives with the fact that should you wish to watch any other formats, that the screen will not have the correct black masking in place for a nice sharp edge to the projected image. But what if you wanted 2 formats or 4 formats on the one screen, well this can be achieved by using Multi Formatting screens, which use a series of motorised masking systems, either side or top to achieve the change in ratio formats from viewing one show to the next. Which system you require is determined by how your projector handles the change in formats, either cropping them top and bottom or the sides. Once you have established this then you can choose the matching multi formatting system for your projector. Screen Technics produces a range of screens for this situation being the DualTech Formator Series 1 and 2 and the QuadTech Formator for those wanting 4 aspect ratios for the ultimate home theatre screen, all of which can be had in either roll down or fixed frame systems. Why are my 140” and 150” screens radially cut? We buy screen material on a roller. We roll out 100 metres of it. For screens up to 3050mm wide we take the material off the roll as is and apply it to your screen’s roller in the same orientation. If we go wider, we must turn the material sideways and problems begin. So, we’ve stopped doing that and we’re using a wider fabric, made of PVC. We stretch it and then put it on your screen’s roller. To eliminate the fullness, we radially cut the sides to improve the lay-flat.